The film Mrs. Doubtfire came out the same year that my parents got divorced. I watched this movie over and over and over again until I knew every line, every intonation, and every gesture by heart. At the time, I had also just started a new public school, and although I slowly made friends, I had difficulty fitting in with the already established groups of girls. I felt very alone. To this day, I credit Robin Williams’ performance in that film for getting me through two of the most difficult years of my life. There were days when the thought of going to school made my physically ill. When I watched Mrs. Doubtfire, I saw a family coping with the same difficulties as I was — a broken family, children missing their father, a now single mother struggling in her new role. Not to mention what I was feeling — the shame, embarrassment, fear, and anxiety. This film acknowledged the pain of such situations, and took away the taboo of divorce for a generation of viewers like myself. Watching Williams as both the newly divorced Daniel Hillard as well as the comical Euphegenia Doubtfire helped normalize the situation in my personal life because I could watch the humor play out on screen. Robin Williams’ performance gave me one of the greatest gifts I could ever ask for, and that is the tool of comedy — as an icebreaker, as a way to disarm, as a way to cope with the implicit tragedies of life. If you know me, you know I use it every day. After all, behind every laugh or smile lies something greater — a somberness that is more easily expressed through laughter. In the twenty or so years since Mrs. Doubtfire was released, I have grown to appreciate Robin Williams as one of the most talented actors and comedians I have ever had the privilege of watching, from his mentoring of Matt Damon and Ben Affleck in Good Will Hunting to his perfectly understated portrayal of Armand Goldman in The Birdcage. And let’s not even talk about his improvisational skills, or the fact that he developed a friendship with Koko the gorilla. If you haven’t already, please watch his amazing, life-changing interview on Inside the Actor’s Studio. It is lines delivered by Robin Williams that have shepherded me through the difficulties of life. The only consolation that I can take away from the tragedy of his death is the fact that he was able to share his gift with the world for over sixty years. Imagine if he had chosen to keep it all inside. 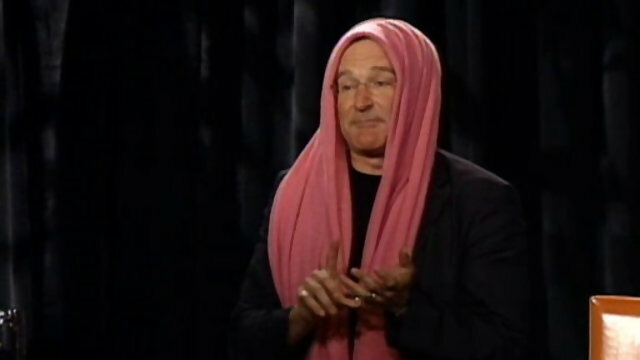 How many people like me did Robin Williams have an impact on? I just wish someone could have done that for him at his darkest time. Tonight, I say this: I hope you find peace on the other side, Mr. Williams, and thanks for everything. There’s seating in the front, and the concert begins at 5. ‹ Gracie and Jynx: Reunited and It Feels So Good!